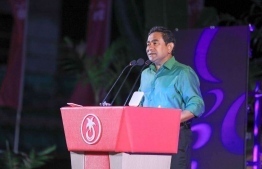 President Abdulla Yameen Abdul Gayoom has stated that opposition presidential candidate Ibrahim Mohamed Solih (Ibu) lacked the courage to speak against European Union’s (EU) sanctions that threaten the livelihoods of Maldivian citizens. Speaking at the ceremony on Wednesday, inaugurating six major development projects that were completed in Thinadhoo, Gaafu Dhaal Atoll, the president described his rival candidate as a tongue-tied figure while expressing his discontentment regarding Ibu’s lack of actions. President Yameen expressed further concerns stating that opposition parties have constantly urged international bodies to impose sanctions on the tourism sector of the country, but that he wished to develop regions across the country through the means of tourism. “Opposition candidate Ibrahim Mohamed Solih could not insist against this publicly, nor against the EU, to demand and request foreign bodies to step back, in protection of our civil rights”, said the president, criticizing Ibu’s lack of willpower to demand political space for a free and fair election without the influence of foreign nations, further stating that the opposition exists in the shadow of international bodies. The incumbent president stated that the election on September 23 has international influences that exceed far beyond the influence persistent throughout previous elections. Responding to the criticism of the opposition over his government strengthening diplomatic ties with Middle-eastern Islamic nations and China, the president claimed these ties served no invasive purposes to influence civil matters of the country. The president stated that Maldives has only benefitted from these strengthened diplomatic relations. The president declared that Thinadhoo had faced great damages by the Maldivian Democratic Party, stating that when their administration toppled on February 7, 2012, buildings of significance within the island were torched as a consequence. President Yameen announced plans to further develop tourism and pledged to establish 6,000 tourist beds in the atoll, should he be elected for a second term.